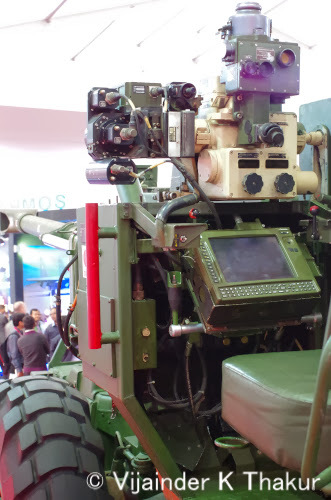 Dhanush features advance electronic equipment for accurately laying the gun on target at long ranges. OFB's Dhanush 155-mm/45-cal towed gun on Friday, June 20, 2014 successfully completed critical trials at Pokharan paving the way for production to commence. According to TNIE, the trials were witnessed by Minister of State for Defense Production Rao Inderjit Singh. The trials cleared doubts about the gun arising from a barrel burst in August 2013, during last year's summer trials. OFB investigated the incident and concluded that neither the gun nor its barrel were at fault. It carried out internal firing trials to validate the conclusion. Following Fridays success, the Army will now follow through the summer trials from the point where they were abandoned last year. The gun successfully underwent winter trials at high altitudes in Sikkim last winter. The Indian Army and Ordinance Factory Board have teamed up to build the 155-mm/45-cal Dhanush towed gun using TOT from the late 1980s contract to purchase 155-mm / 39-cal FH 77 B02 for the Army. Besides longer range than the Bofors gun, Dhanush features advanced electronics to accurately lay the gun on target. The Army has projected an initial requirement for 414 of these guns, each of which will cost over Rs 14 crore, as part of its long-delayed artillery modernization program. IDP Sentinel members can read more about the Dhaush towed gun at the link below.